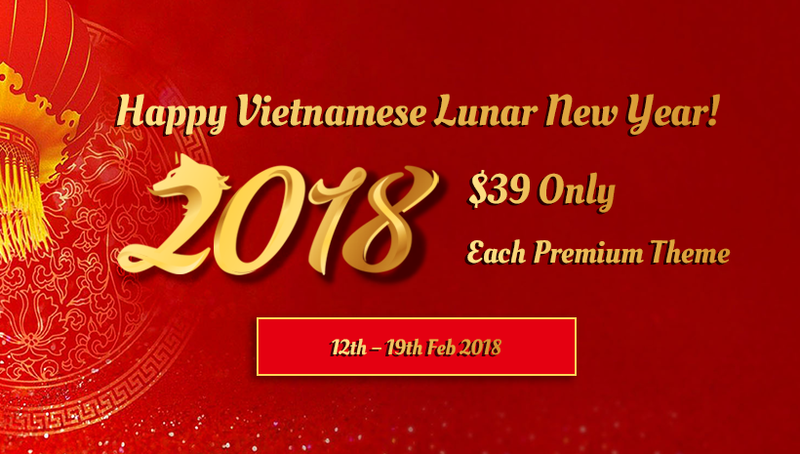 NooTheme / Announcement / Cheer Lunar New Year with Us Plus Lucky Discount!!! Vietnamese Lunar New Year is coming!!! We get so much eager for our traditional holiday – Tết Holiday as well. It’s the time we are off from the office and back home to celebrate happy moments with our family members and friends. On this special occasion, we send you a lucky gift as our gratitude and a wish for Health, Luck, and Prosperity. You can get the AMAZING PRICE $39 ONLY on any premium themes from NooTheme during the time from 12th February to 19th February. The customer support process will be slower than usual! Please noted that our customer support process will be slower than usual during the traditional holiday because our staffs will have ONE WEEK OFF from 12th February to 19th February to celebrate this holiday. If anything happens to you on these days, please still submit your topic on our forum, we will try to solve as soon as we are back the office. We apologize in advance for any inconvenience this may cause you.